It was the Eagles who signed off ‘Hotel California’ – their ode to man’s journey from innocence to experience – with the observation ‘we are programmed to receive. You can check out any time you like, but you can never leave’. It is a lyric that offers a pertinent point of reference for the ageing patrons of the Exotic Marigold Hotel, as they too seem similarly bound by such an insidious insistence. But more of that later. Charting the travails of a group of senior citizens on vacation in India, the original film was a culture/generation clash that mined stereotypes for laughs (incurring occasional rolling eyes in the process), before resolving into some gentle clichés with surprising pathos. Now, the gang return for a follow-on 4 years later, and the fit is as warm and comfy as a favourite coat on a cold winter’s day. Sure, those who quibbled with the former film will find little to enjoy here – it mines the same turf and, for all intents and purposes, skirts dangerously close to an out-and-out rehash. Dev Patel’s Sonny is engaged to Sunaina. The hotel is a victim of its own success, meaning that it is fit to bursting point. Investment and expansion is on Sonny’s entrepreneurial mind. Whilst seeking funding, they are faced with a true dilemma, as 2 guests arrive for the last remaining room. Could one of these guests be an undercover employee from the potential creditors? Misfires are easy to locate. The Richard Gere-effect sprinkles some American stardust onto the setting, but the plot strand is lifted more or less directly out of the ‘The Hotel Inspectors’ episode of Fawlty Towers. The film is also slightly overlong. The twists and turns of the character’s fortunes are a little idealistic and bordering on trite. And yet, to quibble with the familiarity is to miss out on its strength. It is actually greater than the sum of its parts. You find yourself asking, why do these two films work? Well, the hotel is the perfect metaphor for the quandaries facing these characters. Arrivals, departures and sheer bloody mindedness to name but a few. These are the traps, the sunsets and the false dawns that nudge into many a person’s life, along with the greatest looming sunset of all; the time when we finally slip off this mortal coil. The characters are woven with the unspoken, and spoken, ravages of their travails. The highs and the lows of their life experiences have left them richer, wiser and braced for change. It is at once invigorating and beyond the realms of reality. Then again, couldn’t the same be said for Jack Nicholson’s late-career masterpiece About Schmidt? The fact that this sugar-coated rumination can be projected onto a big screen as mainstream cinema is something that should be welcomed as a pleasing antithetical antidote to a broadly youth-obsessed industry consumed with superpower superheroes. All in all, it is a film that brandishes the same faults as its predecessor, but it also defies the odds by being just as funny, sad and affecting. It is in no other sense ‘the second best’ Exotic Marigold Hotel. It is an Indian summer for all involved. Take it on the terms it offers; it is no masterpiece, no, but to be snobby about it is to miss the point completely. 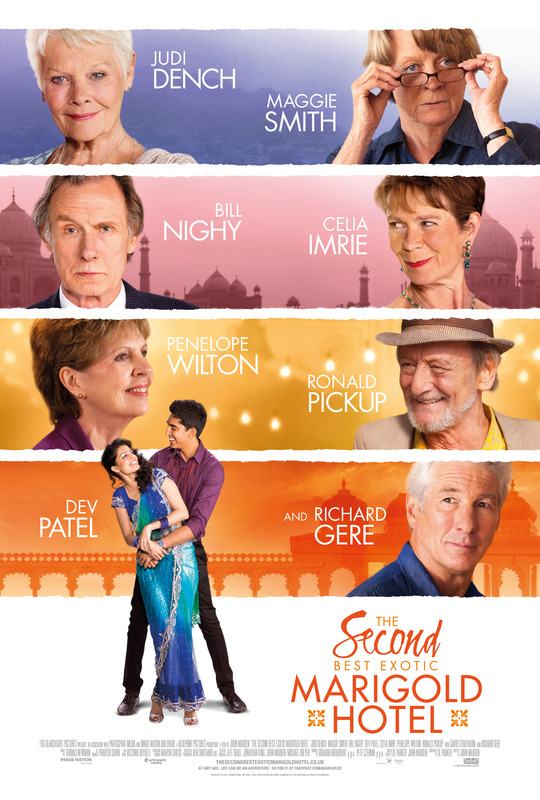 The Second Best Exotic Marigold Hotel is in cinemas from 26th February 2015. You’re right. This movie is so colorful and shows so much of Indian culture. 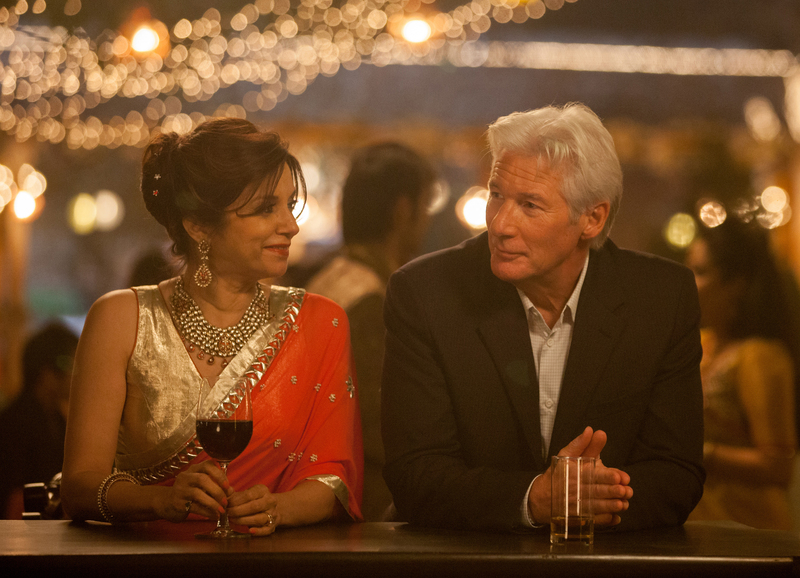 Richard Gere really still has his presence, and such cultural mix in the movie certainly shows how India could be: loud, crazy, colorful… and fun. Great review and insight, totally enjoyed reading your post. This entry was posted on 25/02/2015 by toomuchnoiseblog in Reviews and tagged bill nighy, celia imrie, dev patel, Film, Greg Wetherall, john madden, judy dench, maggie smith, Review, second best exotic marigold hotel, sequel.